Forty-five minutes before robbing staff at Warwick Post Office, Daniel Holder handed one of them a letter with his name and address on – so the police would know where to find him. And when officers turned up to arrest him the following day, he had already put the clothes he had been wearing at the time into a police evidence bag. Holder (33) of Coventry Road, Warwick, was remanded in custody after pleading guilty at Warwick Crown Court to the robbery. Prosecutor Matthew Brook said that on March 14 one of the managers was preparing to open the post office in the Shire Hall in Warwick at just before 9am when there was a knock on the door. “She went to the door and saw the defendants, who she recognised as a regular customer. “He then left, and returned at a quarter to ten. “Sue Emms, the postmistress, was serving a customer who had put some money on the desk. Mr Brook said that as Mrs Emms pressed the panic alarm, Holder leaned over and grabbed the money insert from the till which contained around £2,500, and then fled. He had £121 on him, and a further £85 was found in his home, but the rest of the money was not recovered. 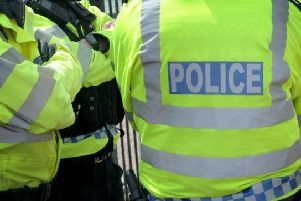 And bizarrely, at his home the officers found a police evidence bag into which Holder had put the clothing he had been wearing, together with the insert from the till and some Post Office paperwork he had also taken. Mr Brook added that Holder had previous convictions for offences including burglary, theft and assault. Justin McClintock, defending, said that while on remand, Holder had been transferred to a psychiatric unit where he has been receiving treatment. He is suffering from a mental disorder, for which doctors agree he needs further treatment and have recommended detention in a mental health unit. “I wonder whether, with probation input, a hospital order is entirely necessary in this case, given the time he has spent on remand. “My submission is that there should be a pre-sentence report dealing with the possibility of Mr Holder being safely managed in the community,” argued Mr McClintock. And he said one of the psychiatrists who has examined Holder should attend at the next hearing to give evidence on whether a mental health treatment requirement, which takes place in the community, or what is known as a ‘hybrid order’ would be more appropriate. Under a hybrid order, a judge can order a defendant to be treated in a hospital but, unlike with a more common hospital order, rather than being released once treatment is no longer necessary, the defendant would be returned to prison to serve the rest of their sentence.